Brian Huber was raised in New Orleans in a house full of art and artists. His earliest creative influences were his mother Janeth Murray and aunt Lynne Gleason – both successful artists. Part of the creative gumbo was his grandmother Sculptor Rai Murray. A music filled studio, the smell of fresh paint and piles of paintings to name are fond memories of the time at home. Brian studied Art and Architecture at the University of Louisiana. He spent numerous years designing and orchestrating events for major television studios and corporations. For five years Brian split his time between New Orleans and San Francisco. After a few years in the city he moved to the eclectic houseboat community in Sausalito. He now lives with his wife in Marin County and is grateful to have more time in the studio. Brian’s work is based on the abstraction of landscapes, architectural elements and the impact of man on the natural world. Raised in New Orleans, Brian was influenced not only by an unconstrained culture and the rhythmic motions of blues and jazz, but also an environment where hurricanes could change or destroy everything in minutes. Brian transforms landscapes and manmade forms into something new. 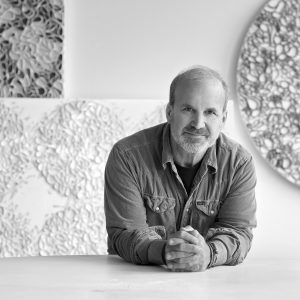 His pieces represent physical changes on a grand scale —anything from the construction of a beautiful building to the devastation of a man-made disaster. Brian cuts and manipulates giant sheets of acrylic paint to create the distinctively sculptural texture of his pieces. The constant change of light and shadow alters the color and pattern of his creations, breathing life into them. Previous series include Water Rising, which deals with the rebirth of his hometown New Orleans after Katrina, and Barrier, which was inspired by man-made oil disasters, false barriers between nature and man, and the recovery energy that resides in deep in the swamps, gulf and wetlands. In his next series, Follow the Line, Brian explores what lives on either side of the imagined lines we concoct for ourselves to cope with life.The Veil series introduced a discussion about how the hidden veil we all wear distorts our views and alters the way we consume reality. This discussion continues in the Circle Back series, which plays with light and shadow on wrought ironwork found throughout New Orleans. An abstracted interpretation of the braided rivers and glacial moraines of the Denali Alaska landscape is the focus of Braided. Circumference and Shard are current series being exhibited in 2018. You are invited to visit the studio. Please contact Brian to set up an appointment. 2017 ArtRooms Art Fair, London U.K.